I've had this polish for well over eight years, and as hard as I try, I can't remember where I purchased it. All I know is that I got it somewhere in the southeastern part of the United States. I have a soft spot for duochrome polishes, and this polish is an exotic gem in my collection. 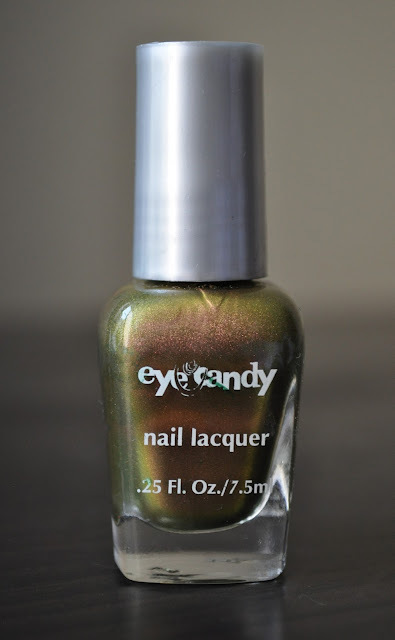 The Eye Candy nail lacquer is a pale, murky, bronzed chartreuse, with peach shimmers, and a radiant, slime green (sounds unattractive, but it works) duochrome finish. You have to see this beauty, in person, to admire it in all its wonders. Apparently, this obscure brand thought it would be a great idea to NOT have the name/number of the polish printed ANYWHERE on the bottle...doesn't it drive you up the wall when brands do that?! The only thing I do know is that I paid $3.49 (the price sticker was still on) for this unique nail lacquer. Have you heard of this brand, or know of this color? Do you have any Jane Doe polishes in your collection?